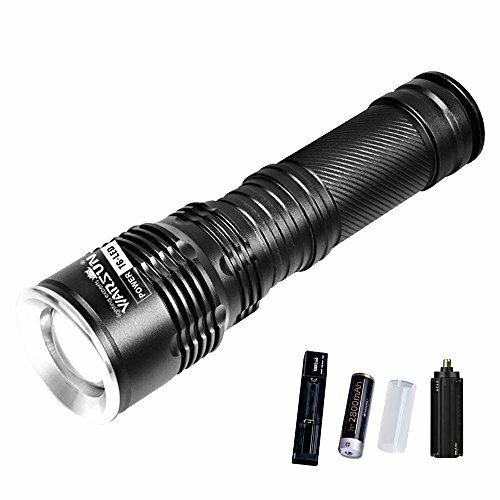 【SUPER BRIGHT】: 1200-lumen (max) Fully zoomable from wide to narrow beam.Tactical flashlight body made of aircraft grade aluminium alloy for durability and robustness. 【5 LIGHTING MODE】: High/Middle/Low/strobe/SOS. Zoomable design allows you to easily switch from a narrow beam to widespread coverage. 【IPX6 WATERRESISTANT】: Skid-proof and water resistant design(work in heavy rain), best suitable for Outdoor Camping,Hiking, Climbing, Cycling, etc. 【LARGE CAPACITY POWER】: The led rechargeable flashlights use 26650 high-capacity lithium battery, up to two times the life of ordinary flashlight, the longest life time of up to 8-10 hours. 【SATISFACTION WARRANTY】: 30 days money back guarantee, and 12 month manufacturers warranty, lifetime support.